…the dog has earned at least one of the following: AKC JH title (junior hunter), GRCA WC Title (working certificate), AKC BN title (beginner novice, obedience), AKC RN (rally novice), CKC CH (Canadian Kennel Club Championship), or a minimum of 3 points in the U.S. AKC breed ring (conformation). If you decide to show AKC conformation, they do require ‘full registration’. In that case, our names will remain on the dogs registration papers until the conditions above are met. Breeding rights are not automatic in this event. We do not charge more for a performance, show, breeding prospect than we charge for a pet puppy at the time of sale. Instead, for females we will require $1000 or the price of a puppy, whichever is greater out of the first litter of said dog. For males we will require $1000 or the price of stud fee, whichever is greater out of his first breeding. All breedings must be done with OFA health cleared golden retrievers. We will stay on the registration papers as co-owners through the first 2 litters. Cost to remove seller from AKC papers is the responsibility of buyer. Your puppies registration will be sent in by us (included in the price). 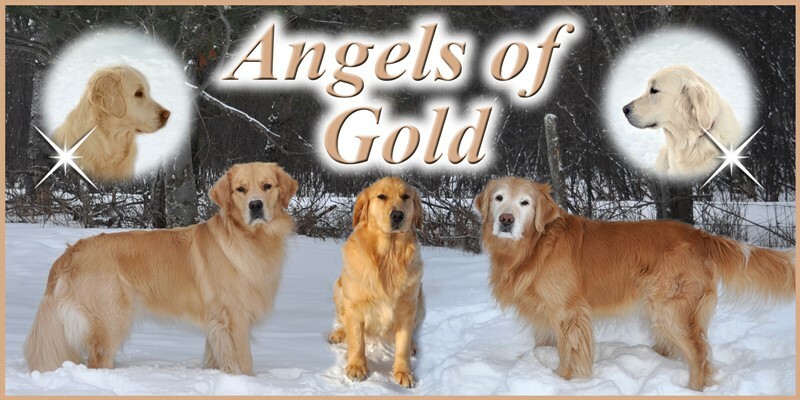 It will have ‘Angels Of Gold’ as the first name, the rest will be chosen by the new owner and told to us within one week of adoption so papers can be sent in, in a timely manner. Pet puppies ARE REQUIRED to be spayed, at 12 months old, neutered at 18-24 months with proof from veterinarian sent to seller. A penalty of $100 will be assessed for each month past requirement. hip/elbow dysplasia is a multifactoral disease and cannot be linked solely to a single genetic cause. Hip/elbow dysplasia is greatly affected by both environment and nutrition. It is recommended that the puppy be fed a premium, high quality dog food to ensure proper growth and development. This puppy should also be raised and exercised in a way that is conducive to optimum joint health. If for any reason an OFA report shows evidence of hip dysplasia or elbow dysplasia, on a Angels Of Gold puppy, (which has to be done between the age of 24-26 months), the seller will replace purchased puppy with a replacement puppy as soon as one is available , after receiving failed OFA verification and veterinarian report of spay or neuter. Puppy will be wormed, shots and vet checked before leaving for their new homes, health certificates also if being shipped. Puppy will most likely be chosen by seller, with your input, so please tell us everything about yourself and what you are looking for in a dog on the puppy inquiry form. You may not know which is yours until 7-8 weeks if we have some going to Show/Performance/breeding homes. Those puppies will be chosen first. Puppy must be taken to your veterinarian within 2 days of arrival at new owner.